Greg Lemond accuses Tour de France riders of using motors. 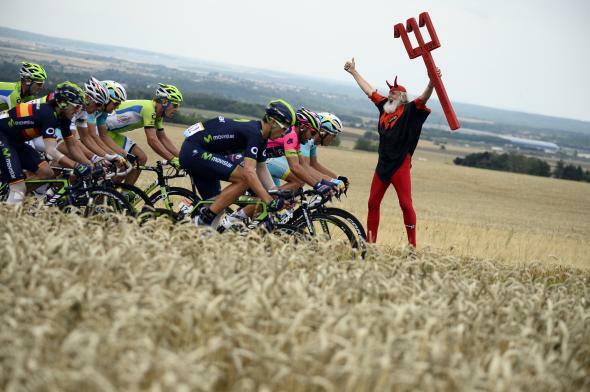 Tour de France cyclists are familiar with dealing with this guy. The Tour de France is currently underway and with it comes that annual flicker of cycling interest beyond nations bordering the Mediterranean Sea. With the sullied Lance Armstrong years no longer a part of the sport’s proverbial peloton, thankfully the focus can be reset on the athletes and the historic competition. The only problem: The most interesting part of cycling is the creativity that goes into cheating at cycling. Motors! I thought we had another name for bicycles with motors. At some point, you have to think, if you’re just going to put a motor on your bicycle to win the Tour de France, why not just sign up for Little League and rob a bank while you’re at it. The social contract has been annihilated. Nothing is sacred. It’s like getting your point guard to wear stilts during the playoffs to make him 6’10 in hopes it will bring home a championship. It’s like a pitcher funneling balls into a pitching machine from the mound rather than throwing the balls himself. I’m sure there are other (better) analogies, but I’ll stop there. “Thermal heat guns?” To make sure cyclists are riding bicycles during a bicycle race? Creative cycling subterfuge, it’s a special thing.